....from its GIOVE-A satellite, which signalled the start of Europe’s ambitious Galileo satellite navigation program when it secured vital frequency filings on the January 12, 2006. The 660kg GIOVE-A satellite was designed, built and tested in only 30 months for just 28 million euro – demonstrating that innovative low cost small satellites could fulfil prominent institutional space missions. Launched onDecember 28, 2005, GIOVE-A was one of two in-orbit testbeds for Galileo. 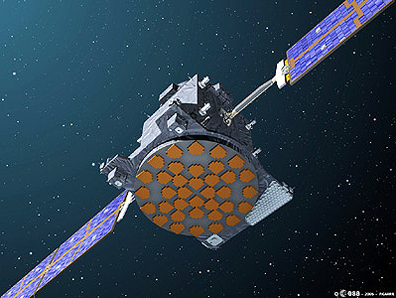 Built with a design life of 27 months, its mission was to secure the radio frequency filing for the Galileo satellite system with the International Telecommunications Union (ITU), test the critical Galileo payload equipment, and perform tests to characterise the radiation environment of Medium Earth Orbit (MEO) – the region of Earth’s orbital space used by navigation satellites. Despite being the first European satellite launched into the demanding MEO environment, GIOVE-A remains fully operational having been declared a full mission success by ESA in 2008. Today it has surpassed its design life by almost four years, and continues to provide the European Space Agency (ESA) with data about the payload performance. Following its success with GIOVE-A, SSTL is currently building the payloads for 14 satellites that are being supplied to ESA and which will provide the Initial Operational Capability of the Galileo constellation, providing navigation services to end-users. Galileo is Europe’s own Global Navigation Satellite System (GNSS), providing real-time positioning services with unrivalled accuracy and integrity. It will be interoperable with the American GPS system and Russia’s GLONASS system.